Dwarf Banana | Gurney's Seed & Nursery Co. Imagine plucking tasty 4-in. bananas from your very own tree! plant adorned with large, glossy green leaves will produce fruit within 3-5 years. Potted. Zone 10. SpacingContainers. 1 plant per pot. FoliageGlossy green leaves to 3 feet in length. Soil RequirementsWell-drained, rich moist soil. Equal parts sand, loam soil, peat moss. PruningDo not prune or cut back. CommentsTropical flare for your home. Imagine plucking tasty, 4-inch bananas from your very own tree! 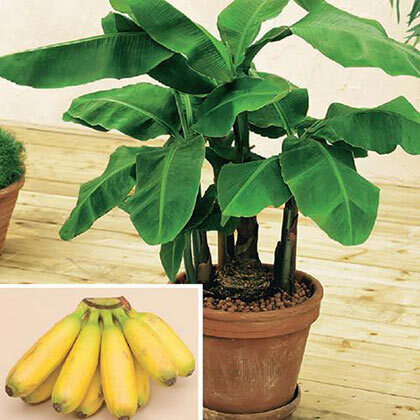 6-10 foot plant adorned with large, glossy-green leaves will produce bananas within 3-5 years. DepthPlant at same depth as in the pot it is shipped in.